Daniel Pemberton - The Man from U.N.C.L.E. One of the unfortunate movie casualties of summer 2015, Guy Ritchie's big screen take on popular 1960s espionage TV series The Man from U.N.C.L.E. struggled to find an audience. Intentionally retro and throwaway in the manner of the series itself, the movie's immaculate visual pastiche of 1960s European cinema also seemed to do little for the majority of moviegoers, with many commenting that it was all style over substance. That's undeniably true – but what style it is, immaculately tailored and fabulously designed. 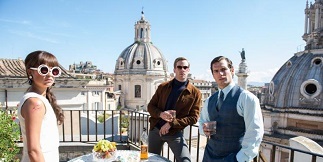 Man of Steel's Henry Cavill and The Lone Ranger's Armie Hammer take over from Robert Vaughn and David McCallum as, respectively, CIA agent Napoleon Solo and the KGB's finest Ilya Kuryakin. The admittedly flimsy plot involves little more than the search for a nuclear bomb that has fallen into criminal hands, a development that forces the two rival agents from either side of the Iron Curtain to work together. Caught right in the middle is Gaby (Alicia Vikander) whose father has seemingly been kidnapped by the villains for the purposes of his nuclear expertise. Divisive though the film's sense of style has turned out to be, it does provide up-and-coming British composer Daniel Pemberton with a real opportunity to show what he's made of. 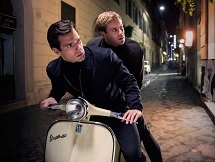 The versatile Pemberton has in the past turned his attention to homegrown ghost stories (The Awakening) and gritty thrillers (Ridley Scott's The Counsellor) but The Man from U.N.C.L.E. is surely the one that's set to put him on the map properly: a wonderfully stylish homage to a whole host of 1960s music masters including Lalo Schifrin, Henry Mancini, Ennio Morricone, Jerry Goldsmith and John Barry. 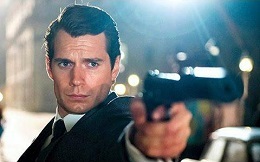 Indeed, one of the most pleasing quirks of film music in 2015 is how much the industry has referenced Schifrin's iconic Mission: Impossible vibe, from Henry Jackman and Matthew Margeson's Kingsman: The Secret Service to Joel Kramer's Mission: Impossible – Rogue Nation and Christophe Beck's Ant-Man. Pemberton's attempt is surely the best of the lot, or at least the most authentic. Dripping in atmosphere and spanning a host of styles from acid jazz to lounge chic and full on spy movie dramatics, it's hugely entertaining. It's worth noting of course that the original Man from U.N.C.L.E. TV series had an illustrious musical heritage with the legendary Jerry Goldsmith providing the snazzy title theme, subsequently adapted by successive composers including Morton Stevens and the aforementioned Schifrin. There was also a famous 1960s vinyl arrangement by Hugo Montenegro, famous for re-arranging Morricone's The Good, The Bad and the Ugly theme. Yet for all the series' convoluted musical history, it's surprising to note that Pemberton doesn't reference Goldsmith's theme in any way, although when one considers that Ritchie's movie is in many ways its own beast, it's perhaps understandable. In fact, there are very few identifiable themes at all. What Pemberton does instead is use instrumental textures and motifs as signifiers of Solo's and Kuryakin's backgrounds, weaving carefully around a well-chosen selection of finger-popping classics from the likes of Nina Simone, Roberta Flack and Debbie Morris. The score kicks off with "Out of the Garage" and one of its most identifiable ideas becomes apparent: a bass flute played in a style called "fluteboxing" in which the player blows and also hums into the instrument, giving a uniquely rhythmic, piping sound that screams chic cool. Broadly speaking, this idea applies to suave CIA operative Solo and it represents his unflappable heroism throughout the score, notably in the raucous "Escape from East Berlin" where it's embellished with a host of snares and shakers a la the aforementioned Schifrin's work; and the terrific "Breaking In (Searching the Factory)" that pulsates with a sense of urgent energy. The other key component is the use of the cimbalom to represent KGB agent Kuryakin. This is an instrument that has frequently been used as a signifier of the Iron Curtain throughout the history of film music, most famously in John Barry's The Ipcress File, and it's brilliantly effective in reflecting Solo's broodier, moodier opposite number. "His Name is Napoleon Solo" (where it melds with an enjoyable, Morricone-esque statement for electric guitar), "Mission: Rome" (whose tapping bongo accompaniment is especially effective) and "The Vinciguerra Affair", where the instrument is pitched at a somewhat lower, more pensive register, are all enjoyably nostalgic, throwing back to a much-loved era of film and TV music. The entire soundtrack hums with a charming sense of nostalgic fun. Tracks such as "Bugs, Beats and Bowties" with its effortlessly suave interplay between drums, xylophone and cimbalom could easily have come out of a sixties spy/caper movie, as could the superb "Signori Toileto Italiano", a piece that has class oozing out of every pore, especially when the accordion counterpoint kicks in to give that added dash of European flavour. Meanwhile the frenetic "Breaking Out (The Cowboy Escapes)" was clearly temp-tracked with James Horner's The Mask of Zorro, erupting in a vibrant blast of mariachi-style heroics. The two "Betrayal" tracks (titled "Into the Lair" and "Laced Drinks") take the score into more straightforwardly dramatic territory, matching the development of the film's narrative as the espionage plot becomes more prominent. The former features darkly swirling, James Bond-esque strings whereas the latter uses the cimbalom as a propulsive texture, merging with the aforementioned string section and bass flute to give a nostalgic vibe whilst still carrying more than a hint of dramatic danger. In fact, it comes close to resembling Alexandre Desplat's Oscar-winning The Grand Budapest Hotel. Two thirds of the way through and Pemberton keeps throwing surprises the listener's way. The best of these is likely "Circular Story" with its swaggering, House of the Rising Sun style-electric guitar rhythms, a fantastic piece of music that may well achieve the rare goal of transcending the film music label and appealing to the mainstream listener. Meanwhile "The Drums of War" owes more to Jerry Goldsmith's experimental side with its cacophonous onslaught of percussion including bass drums, bongos, castanets, congas and much more besides. The eerie male vocals that feature in "Take You Down" will no doubt recall Morricone's iconic works and eventually Pemberton breaks out the full-on rock ensemble for a bit of added attitude. "We Have Location" brings the Solo and Kuryakin instrumental textures together, indicating the new-found solidarity between east and west whilst "A Last Drink" resolves the latter's theme with fulsome strings. Final track "The Unfinished Kiss" is perhaps the most thematic of the entire album, merging fabulously smooth, emphatic strings with cimbalom and drums. 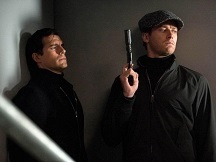 Pemberton presumably built up to this climatic moment with the aim of utilising the piece in future Man from U.N.C.L.E. movies, although given the film's somewhat lacklustre box office performance, it's not clear if this will ever happen. Nevertheless, it's wonderful music. The digital release of the album also features four more bonus tracks that flesh out the composer's various influences, with Morricone's iconic spaghetti western scores again being notably prominent. Listeners expecting a great amount of profound depth from The Man from U.N.C.L.E. will likely be disappointed. 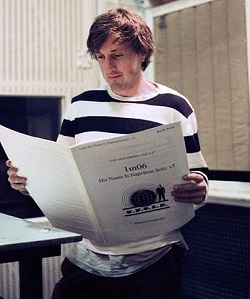 Daniel Pemberton's score is, like the movie, entirely concerned with style and a casual sense of fun, resisting obvious themes in favour of a whistle-stop tour through the various styles of 1960s film music. However, if the primary aim of a film score is to serve its respective movie (and it clearly is), then Pemberton knocks it out of the park. Beautifully snappy, witty and appealing, the score might be all surface but few others this year have proven as effective or gleefully entertaining. The intricacy of the orchestration, from the woodwinds to the percussion to the various ethnic touches like the cimbalom, is dazzling and consistently surprising, crafting a rich soundscape that will remind listeners of any number of film music masters. One of the delights of 2015.